Gardeners make use of assorted discarded items such as jugs and other types of containers. 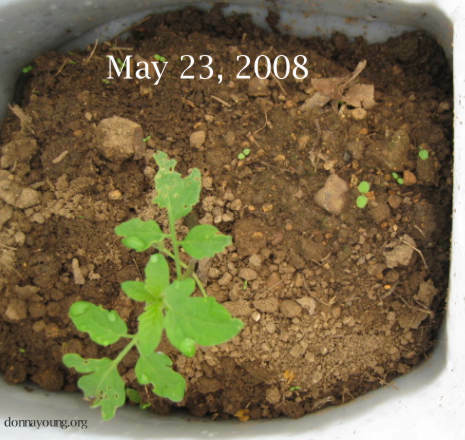 The purposes of the containers are few but all of the purposes indicate protecting a young plant from something. 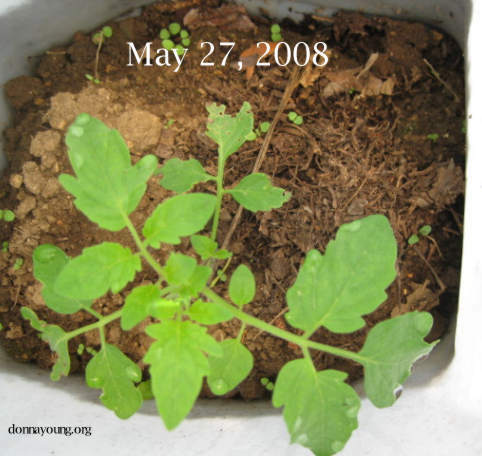 Some of the things that threaten young plants are bugs, animals, hard rain, and frost. Once the young plant is larger and stronger, remove the jug. The plant can usually withstand some damage when it is larger. Not all plants will need a jug, only those that are severally threatened. 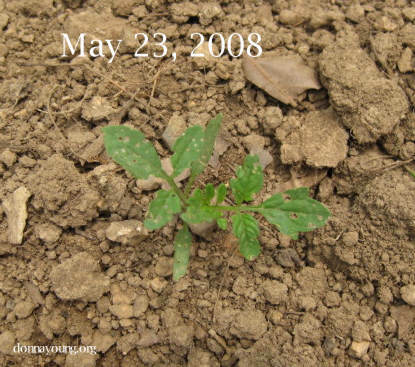 In my garden the threatened plants are a few tomato seedlings that I did not plant. 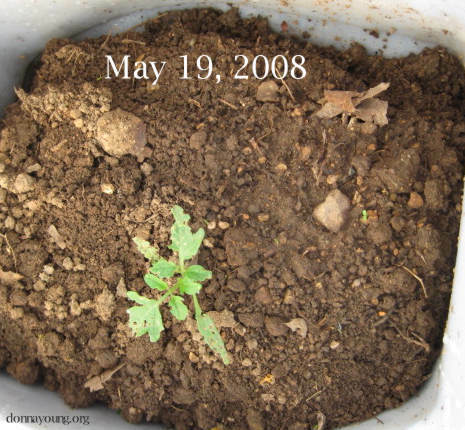 The seedlings are sprouting from last year's cherry tomato plants. All of the tiny tomato seedlings are pockmarked with holes from flea beetles. I want at least one plant to survive so I selected one, removed all the bugs from the plant and the surrounding soil, and put a jug over it. The jug I am using is a cat litter jug. I rinsed it and cut the bottom off the jug. The jug is firmly seated into the soil. An inch or more of the jug's bottom edge is pushed in and buried into the soil. Below are some comparison photographs of the plant today and a few days ago, and one unprotected nearby plant. The plant is growing better now that it isn't being eaten. Note: The jug's lid is removed. The plant receives moisture from condensation and what little rain falls through the jug's opening. Growth is slow on the unprotected plant. Note the lack of central stem growth. The tomato in the jug has grown rapidly in the past four days. In summary: This is just one way of many to prevent bugs from killing or stunting a young seedling without using pesticides.